Abstract: The CNPS9900 Max heatsink has a total heat dissipation surface area on the order of 5402cm2, stands 150mm tall and weighs 755 grams. The manufacturer claims max heat capacity is a whopping 300W! CPU compatibility extends to Intel socket 775/1155/1156/1366 and AMD socket AM2/AM3 processors. Zalman's CNPS9900 Max heatsink may look a lot like the CNPS9900 LED model Frostytech tested in early 2009, but the two coolers are totally different. The CNPS9900 Max is built with better heat conducting 'composite heatpipes,' a more robust mounting system, a larger copper base plate that is machined flat and a 130mm diameter fan. The face lift and design revisions aren't cosmetic, the CNPS9900 Max heatsink performs much better than its forerunner and offers very good low noise cooling too. Like most Zalman heatsinks, the CNPS9900 Max is based off entirely original design concepts; two radial fin arrays surrounding an inset 130mm PWM fan that draws air past one set of cooling fins before exhausting it through the second. 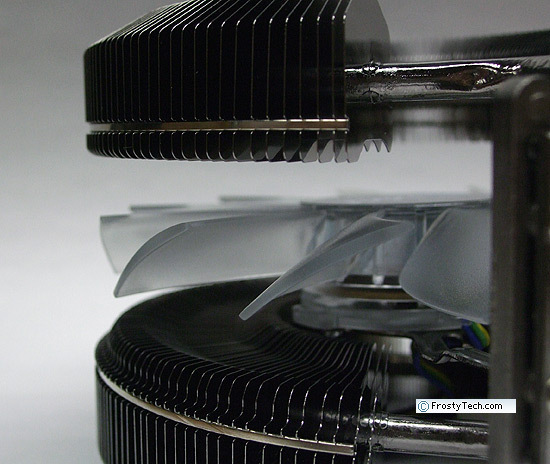 Its three 6mm diameter heatpipes are positioned asymmetrically so the most heat energy is conducted to the nickel plated copper fins directly behind the fan. To keep noise under control, the translucent fan scales from a moderately loud 1700RPM to a whisper quiet 900RPM. The CNPS9900 Max heatsink has a total heat dissipation surface area on the order of 5402cm2, stands 150mm tall and weighs 755 grams. The manufacturer claims max heat capacity is a whopping 300W! CPU compatibility extends to Intel socket 775/1155/1156/1366 and AMD socket AM2/AM3 processors. The real prize is the type of heatpipes used in the construction of this heatsink. Composite copper heatpipes contain a dual wick structure of grooved and sintered metal that makes them more efficient at conducting heat than a typical metal mesh wick. There's no way to illustrate the wick structure on the inside of the heatpipes without destroying the CNPS9900 Max in the process, so please see this Frostytech article on heatpipe wick structures for actual photos of a couple dissected heatpipes. The heatpipe solution employed in the CNPS9900 Max is a combination of sintered and grooved metal wicks, a combination of the first two types pictured. Materials: dark nickel plated copper fins, heatpipes and base. Cast aluminum base cap. 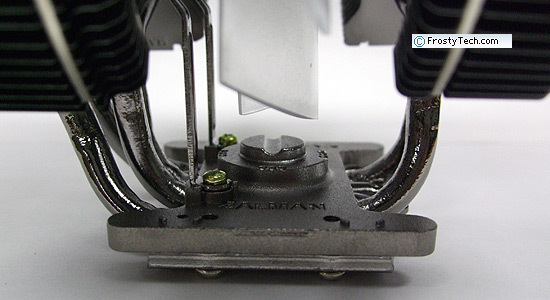 There are a couple other aspects of the Zalman CNPS9900 Max heatsink that make it stand out from the crowd. One obvious aspect is the heatsink's split cooling fins, each of which is joined to the base by only the 6mm diameter copper heatpipes. 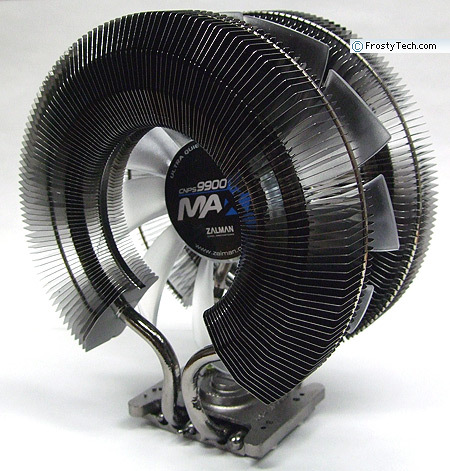 In front of the 130mm fan is a 27mm wide fin section wrapped around one single 6mm diameter heatpipe. Behind the 130mm fan, the second copper fin section is wrapped around two 6mm diameter heatpipes and measures 34mm wide. The choice of an asymmetrical (ie. one side is larger than the other) fin design is unique. 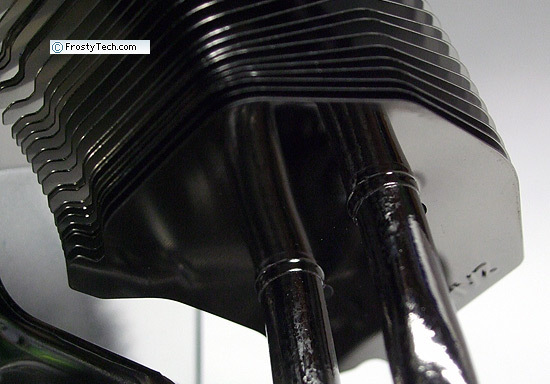 A plastic packing bracket keeps the two halves of the heatsink firmly separated during shipping, but a word of caution. The heatsink isn't fragile by any means, but if you drop it while installing in your PC there is a good chance the heatpipes will bend inward. Same goes if you handle the two halves of the CNPS9900 Max from the outside flat faces and grip too tightly. We recommend holding the heatsink by both round edges for the least likelyhood of heatpipe bending. Zalman's CNPS9900 Max heatsink can be installed on socket 775/1155/1156/1366 Intel processors and the full range of socket AM2/AM2+/AM3 AMD processors. 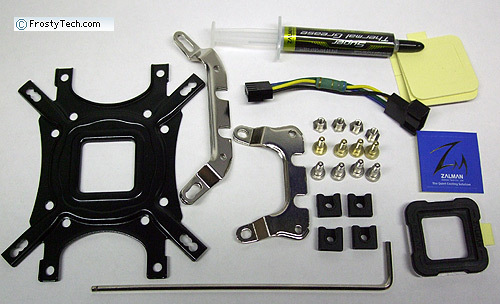 Installation is pretty straightforward, although you will need to gain access to the rear of the motherboard to insert the special metal support plate and associated screw hardware. Separate upper brackets for both Intel and AMD platforms are supplied. These brackets clip into the space between the copper base plate and aluminum base cap after four screws are loosened slightly. 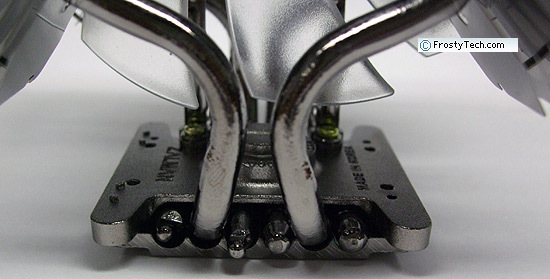 Small barbs hold the brackets in the proper position while the user is tightening the screws back up. This new heatsink mounting system isn't quite as elegant as Zalman's mostly tool-free solutions from years past, but it does firmly hold the 755gram heatsink in place with all metal-to-metal fasteners.